The man who so successfully describes African village life was himself born in a village close to the Niger River on November 15, 1930. Chinua Achebe was familiar with both Christian and Ibo traditions. His father was an Ibo who had converted to Christianity. Achebes early knowledge of the differences between cultures was a valuable preparation for the writing of Things Fall Apart. He wrote Things Fall Apart, partly in response to what he saw as inaccurate characterizations of Africa and Africans by British authors. The book describes the effects on Ibo society of the arrival of European colonizers and missionaries in the late 1800s. Achebes satire and his keen ear for spoken language have made him one of the most highly esteemed African writers in English. An exceptionally bright student, Achebe went on to study European literature at a Nigerian university. His mastery of European and African traditions explains why his Ibo tale has the clear, dramatic form of a Greek tragedy. Although Achebe has worked in both radio broadcasting and publishing, today he earns his living as the Charles P. Stevenson Jr. Professor of Languages and Literature at Bard College in New York. Blackside Inc. (BSI) conducted the following interview with Chinua Achebe (CA) via telephone shortly after the 70th birthday of the patriarch of the modern African novel. BSI: If Okonkwo were living today, how would he feel about the present state of Nigeria? What would be his solution to some of Nigerias problems? CA: Well, we know from the kind of person he was that he would be saying to Nigerians, I told you so, you should have stopped it  you should have stopped this thing when it began. People say that if you find water rising up to your ankle, thats the time to do something about it, not when its around your neck. Okonkwos solution to colonial invasion was to rebuff it, to repulse it, to drive it back. The problem with this is that Okonkwo was the only person in his community who saw the problem and its solution that simply. You see, his community was aware from what they knew of European invasion of Africa at that point that it was not going to be easy to drive it back, they had examples around of communities that were bombarded, of markets that were bombarded. So it was not a simple matter of cowardice or bravery, it was really a question of looking  taking a hard look at the situation and deciding that this thing cannot be handled in this simple way without running very, very great risks. And so the community would be where we are today, that whichever way you turned at the beginning of colonial invasion, whichever way you turned, you were going to come to a sticky end. The colonizers were not going to be persuaded by simple resistance to re-evaluate their intentions. So theres really no escape, thats what Im saying. Theres no escape. BSI: Many in Nigeria have called for a sovereign national conference in Nigeria to deal with Nigerias problems, including giving those minority ethnic groups in Nigeria a stronger voice and control over their natural resources. Would Okonkwo call for a separation of Nigerian states, or would he be willing to work toward a more unified Nigeria? CA: I think in hindsight, he would probably say, OK, we should work together, we should find  we should find a way to talk to one another, to negotiate, to learn from our mistakes in the past. You see, Okonkwos mistake in the past was that his people were deliberating on what to do about the colonial invasion. They had not made a decision, they were still struggling with this debate when Okonkwo went out on his own and killed the white mans messenger. What he intended to do by this was to force his people into the kind of action that he preferred. Now, the Ibo people do not like to be forced to end deliberating as a group. They dont want somebody to preempt them. And so Okonkwo now knows that fact, and I think that would influence his attitude today  what Nigeria needs, its nothing new, it is as old as you have neighbors, that if you have a neighbor, you talk with them, you discuss with them, you reduce the level of hostility. Thats really what Nigeria needs. Its really quite simple. The minorities or the majorities, they are just people who have always lived together in the same space. Sometimes you hear people talking as if they were new to that  their part of Nigeria, or as if their neighbors were new to those parts of Nigeria. Nigeria has not imported any new people. The people you see in Nigeria today have always lived as neighbors in the same space for as long as we can remember. So its a matter of settling down, lowering the rhetoric, the level of hostility in the rhetoric is too high. If we did that, I think we might be able to begin to solve the problems of Nigeria. Then we would be able to enjoy the enormous benefits that will come from the fact that Nigerians are very, very talented people, and Nigeria is a very rich country in manpower and natural resources. And we can really begin to create a new and progressive nation, something that we missed out in the 20th century, and we should  we must not miss out again in the 21st. BSI: In 1995, after General Sani Abacha appointed himself president of Nigeria, he jailed and terrorized scores of journalists, lawyers, and military officers accused of plotting against him. 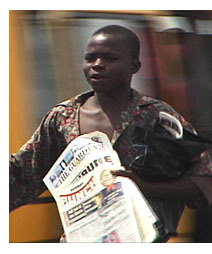 What is your take on the treatment of journalists and other political activists in Nigeria, past and present? What was your reaction to the execution of Ken Saro Wiwa? CA: Well, my reaction [to Wiwas execution] was  it would be expected, horror and great sadness that I indicated at that point. The situation with Abacha was particularly painful to me because when he came to power, when he seized power, I was very angry that there were people who were able to say that we should give him time, because he might be better than Babangida, the general who had annulled the election that was held. There were people who did not feel as angry as they should have that another soldier was coming up and making promises about when he would hand power back. And some of the people who were saying this were journalists, so I was really quite annoyed that we were now dealing with yet another soldier, who was even worse in terms of intellect, in terms of anything, to Babangida. We in Nigeria now have a lot of responsibility for the decay of Nigerian politics, because theres no unity, there was no determination to say, enough is enough. Whenever one soldier came up, there would be someone saying, oh, hes better than the last one. And we failed to recognize that there was no solution, there was never any solution in military dictatorships. Before Abacha, we had Babangida, who in the view of many people actually destroyed the Nigerian nation by that decision to annul an election that was laboriously arranged and executed. He called into question any possibility of a peaceful transition from one government to another. Abacha was simply the last crude conclusion of a train that had been set in motion. And therefore, what Abacha did, including the hanging of Ken Saro Wiwa, was not really surprising to anyone who knew the quality of the man. He was a man you would not dare  if you said to him, I dare you to do this, he would do it. And that, when you get to that level of response, action and response in politics, you are in deep trouble. And Nigeria was in deep trouble. BSI: Many speak of the brain drain that takes place in Nigeria. Some of its sharpest minds, including you, have moved abroad. What are your reasons for exile? CA: Well, everybody has his or her own reason. My reason is primarily  Ive said this many times  has to do with this spinal injury [Achebe was paralyzed from the waist down in a serious car accident], which I sustained 10 years ago. I would have been out [of Nigeria] whether or not there was Abacha, because the medical facilities in Nigeria had deteriorated to a point where it was impossible for me to have the surgery that I required after my accident. So that was why my exile began  it did not begin with the political situation in the country, although the political situation in the country indirectly created the situation in which our hospitals were no longer functioning. But you will find that there are many people who left the country for a whole range of reasons. Safety  is one major reason, but also simply because a professional, for instance, who can no longer carry on his or her professional work, a doctor in a hospital who can no longer carry on his work because the hospital has broken down  to give you one personal example, a surgeon who flew out with me after my accident, flew out from the teaching hospital where I was being treated in Nigeria until it was discovered that I needed to go abroad, to England, and the doctor traveled with me. And when we got to England, he discovered that the surgeon who was going to perform the surgery on me had been his classmate. The point Im making here is that he  this Nigerian surgeon could have performed the same operation if the facilities had been there in Nigeria. Im simply hoping that we will quickly get the country back to a state where a large number of these people will begin to go back. Because this is really where their work is, its not because people love America more than they love Nigeria. Its in Nigeria that their heart is. And so its painful for these professionals. BSI: Your representation of indigenous Ibo culture contradicts stereotypical, often oversimplified European representations. Most people around the world know a little of Nigerias traditional past directly because of you. How have you come to terms with this awesome responsibility? And do you feel that you tell it like it is, or are you sometimes tempted to romanticize certain aspects of traditional Nigerian culture? CA: First of all, let me take the second part. I do not romanticize, because that was the one thing that was very clear to me 40 years ago when I was a young man beginning to write, that I was not going to romanticize my culture, because I knew that theres a matter of integrity in artistic creation which is involved, and that your reader must trust what you say, that what you see is what you are going to report. It is such as serious issue, ones story  other people who have a vested interest in undermining my humanity have bastardized my story. So its a very serious challenge they have thrown at me. I have no question  no doubt whatsoever in my mind about my humanity or the humanity of my people. And the story I am going to tell is to make this humanity apparent. Now, you note Im talking about humanity; Im not talking about angels. Im not talking about perfect beings. Im talking about people. And so it was important to me  if I knew nothing at all about novel writing, I knew this one fact, that I wanted to make the humanity of my people apparent. And at the end of my story, what Im saying to my reader is, now Ive told you about these people, I dare you to challenge their humanity. BSI: What effect did politically charged musicians and artists, particularly Fela Kuti, have on Nigerians? And how do you see these artists affecting change? CA: Oh, quite a lot. As a matter of fact, Fela Kuti was a good friend of mine, and in my exile, I went to the University of Massachusetts to hear him perform a few years before he died. And we were  I would say kindred spirits. He was in music and I was in literature, and there were other kindred spirits. Felas influence on Nigeria was quite strong, in fact, phenomenal. And Nigerians appreciate his work. Thats really all I need say. BSI: What is your sense of hope for the continent? And does this hope largely come from Africas women? CA: Well, I think the women are extremely important in that  in our culture, whenever things really got out of control, when things were damaged beyond repair, the culture seemed to call on the women to move in and repair the damage. Historically, this has happened a number of times in our history. When the British came to Ibo land, for instance, at the beginning of the 20th century, and defeated the men in pitched battles in different places, and set up their administrations, the men surrendered. And it was the women who led the first revolt. They said it was a revolt against taxation. It was actually a revolt against imposition of foreign rule. And it happened in such a spectacular way  the British could not understand it  what was going on. Here were these peasant women scattered over hundreds of square miles, and they were able to get into action in a very coordinated way. The British pulled back, and went to study the Ibo people again. That is the kind of thing I have in mind when I talk about women coming in when things seem to be completely hopeless. Somehow in our idea of creation, women are very, very close to the creator. It is very important to them that our world continues. And so they have this last resort responsibility. Now, that was all right in the past. It is something we can look at and learn something from. But it may well be that today, we dont want the women to be in the background until things get out of control. It may well be that they should be in the action all the time so that things dont get out of control.